This week will be reviews on Tattered Angels. We decided to spread this amongst a few of our reporters to get different styles and different opinions. We have Kimberly and Shelley up today. Enjoy! For these projects, I used Glimmer Mist and some of the self-adhesive chipboard pieces. I have to admit that I am not a user of these products. Having tried them in the past, I wasn't a fan. The color left huge spotches all over my projects. BUT, once I read the FAQ's on the Tattered Angels website, I learned how to spray properly. It was very helpful. I hope they continue to add more how-to's and videos. The spray adds a lovely shine, which is hard to capture on film. The chipboard is fabulous and I love the self-adhesive pieces. Its great to not have to reach for a glue. Honestly, I will use the Mists again to color ribbon but that is about it. However, I will definately be grabbing more of the chipboard at my next trip to my LSS. 1. The how-to's were helpful for a first-timer. 2. LOVE the designs of the chipboard. Lots of details. 3. The self-adhesive feature is wonderful! 1. The spray still makes splotches in larger areas, especially with darker colors. 2. It was difficult to find the how-to's on the website. 3. This is messy. Cover your ENTIRE work area with newspaper. For this project, I sprayed two colors on the white rose trim. It blended together beautifully!! I used Raven and Pink Taffy. The frame is a self-adhesive chipboard piece (from an alphabet) that was sprayed with Spring Rain. Supplies-Tattered Angels Glimmer Mist-Raven, Spring Rain, Crushed Shells, Tattered Angels Chipboard Pieces, Cardstock-Core'dinations, Ink-Clearsnap Colorbox Chalk Various Colors, Letters-Making Memories, Spellbinders-Grand Scallop Border. 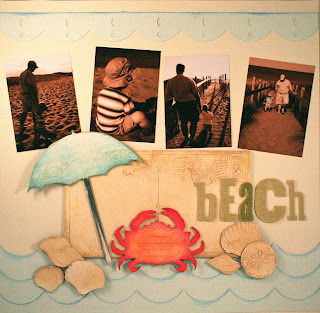 On this layout, I used a bunch of the self-adhesive pieces and the large post card. The umbrella got color from the Spring Rain Glimmer Mist. And its handle got Raven painted on with a sponge. The other pieces were colored with various inks. I have heard of Tattered Angels and I have seen their products in stores but it wasn't until I was sent a little goodie bag to play with that I actually got to use the products myself. The projects I had seen on blogs using Tattered Angels were always stunning! I wasn't disappointed! I really enjoyed working with their mists, chipboard, and paper products. I really liked working with the Chalkboard Glimmer Mist. I loved the soft color that it provided. I found the mists very easy to work with and coverage was excellent. A little goes a long way! I really appreciated how their papers and chipboard works in collaboration with the mists. The stamp I worked with was excellent. It was easy to use and the image was very clear. Here I think it is just a matter of style. I found the images and themes to be more vintage/Victorian which is not necessarily my style but quite lovely for those who are more inclined to create in that style. Using the small chipboard frames I misted them with Strawberry Shortcake Chalkboard Mist and added a photo behind each frame. I then clipped each frame to a piece of ruffle trim to make a quick and easy garland! Here I used some tags and made a quick, easy mini album. Using a Qtip I colored specific areas with the Concord Chalkboard Mist. On the back page I simply "painted" the entire page with a brush dipped in the mist. I used some of the paper accents as well. Here is a quick project using the compass stamp. I then used my circle cutter to cut around the stamp to make a circle album. What do you think? Do you use the Glimmer Mists? Do you have any use tips to share with everyone? What is your favorite way to use them? How about the chipboard? Share your expert opinions! Leave a comment by midnight EST Tuesday to be entered to win a Tattered Angels prize pack! I love the examples shown! You guys do amazing work! The product looks like fun to play with! Shelley, your projects are great and they don't look 'shabby' at all! I am still finding my way with glimmer mist, just bought the large sea stamp set, so will do some experimenting myself! I do like using chipboard shapes, and have started dying plain ribbon to match my glimmer project, that is pretty awesome! I have never used them, but would love to try! Thanks for the giveaway! I have wanted to try these for quite a while. These images made me more determined to give them a try. Love tattered angels! I have their glimmer mists. I love your projects especially the beach layout! I love Glimmer Mist. I have a few colors and would love to expand my collection! I love the look that glimmmer mist gives a project. I find that if I swirl the bottle to mix the mist up instead of shaking I find less blobs when I spray. Love my Glimmer Mists! I always use a big cardboard box when spraying - keeps everything contained and no mess outside the box. I love glimmer mist even if it is messy. Thanks for the chance to win! I enjoy Glimmer Mist but I have to agree that it is splotchy. I have yet to try the chipboard. Wow!!! Gorgeous sample projects!!! I find the Glimmer Mist splotchy too but I usually just "dab" those areas with a paper towel or diaper wipe and it seems to help. I'd love to try the chipboard and new Chalkboard Mist! Thanks for a wonderful review and chance to win an awesome prize pack! Great feedback about this product. I am a very clean scrapbooker but I do like this product for coloring chipboard and I think their chipboard is awesome! I haven't been able to buy any yet but can't wait to play with some. I love using them with a paint brush. And they are great on painting flowers. Thanks for this great giveaway! I love Glimmer Mist so much that my husband can identify it by bottle/label/ and/or name! LOL! I love Glimmer Mists! I use it on lots of projects!!!! My biggest tip is to not shake the bottle before using it. Just roll it back and forth in your hands until the glimmer is all mixed in. I love Glimmer Mist - my front porch is covered in it! It takes some practice, but its kind of fun. My only regret is that the first time I used I just sprayed on the floor of my craft room. interesting...I'm definitely one of those too intimidated to try a messy project! okay, these are GREAT reviews, and i'm TOTALLY curious about the chipboard! plain chipboard that soaks up all the gorgeous colour and shimmer from the mists? YES, PLEASE! i spray EVERYTHING, just so my backgrounds aren't so stark, and i love the effect (even with some splotches). those roses are GORGEOUS, and i am going to try the Q-tip technique tonight! :) love the projects, ladies! I love Tattered Angels products! The mist is my favorite, fabulous colors, great shine and they stay wet long enough to blend well. Love them! I love playing with these. At first, I just used them to add color to pattered paper but after taking a class with Tattered Angels at CKC this past weekend, I am HOOKED! I found that spraying in a sweeping motion as well as starting the spray before hitting your piece helps keep the splotches down. So does swirling the bottle to mix it up vs shaking it up like a can of spray paint. Fun stuff! Great projects ladies! I love glimmer mists - I got to play at CHA and they were so fun! I have a feqw bottles- I am kinda messy when it comes to scrapping so it doesn't bother me I love the glimmer! I've never tried this product, but I think I would love to! Thanks for the chance at this giveaway! I was nervous about giving the glimmer mist a try, as a friend found they splotched as well, so she did not like them. I bought one and have loved it!!! I have had no prob. w/ splotching, maybe b/c the projects were small? Anyway, dying to give more colours a try! I've been afraid to use the Glimmer Mists. Thanks for the tips. I love Glimmer Mists. 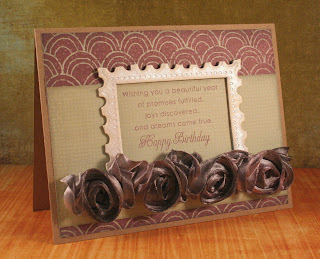 I like getting white flowers and changing them to the color I want also using them to color chipboard. My tip is to make sure you shake them really, really well! I LOVE Tattered Angels prducts! I buy a new Glimmermist when ever i can. I love the chips ans even the screens. And yes, sometimes i look all messed up and there is Glimmermist everywhere! But who cares? Happy crafting!!! i love love glimmer mist!! i buy mostly white flowers or ribbon so i can glimmer mist it. Those are some great projects. I seriously LOVE that card with the roses across the bottom. First timer?? Wow! Love Tattered Angels chipboard and glimmer mist! I am sorry I can't share my own personal experience with Glimmer Mist because I have never used it. I have though admired the work of others who have used the product. It would definitely be something I would love to try out for myself. Thank you for sharing. God bless! I really love the glimmer mist and haven't tried any of their other products. The spray comes out a bit splattered but I happen to like that look so never thought much about it. As for the problem with it covering everything in a 24' radius.. I have a spray box I use for all aerated inks or paints. It works wonders and isn't all that big... about 18"w x 12"d x 9"h.
Although I'm definitly not an expert at using them, I do love Glimmer Mist! I mist everything from paper, flowers, chipboard, alphas...you name it- I'll mist it! One of my fav things to do is to place a piece of kraft paper underneath the projects I'm misting to catch the extra mist. After a few projects the kraft sheet tends to take on a cool effect and I use it as a background or accent for a new layout or project--- so none of my glimmery goodness is wasted!!! I have yet to try out these products. But, I would be willing to play with them if I won this prize. Thanks for a chance to win. Looks fun. i adore mists of all kinds!! i use my gm mostly for chipboard as it leaves an awesome shine! I love glimmer mist! I have several colors and I use them a lot. I can't wait to try their new products. LOVE Glimmer Mist it makes things beautiful! Beautiful examples. I just recently bought an Electric Blue Mist and a Pearlish one. I used the blue on a piece of chipboard I had laying around, to get myself use to this stuff. I don't know how to really use it and it doesn't really give good instructions on the bottle but I do love the way it looks on paper and paper flowers! I am very curious to see it in different colors! I will have to go to their site and look for the how-to's. Thanks! I have Glimmer Mist in 2 colors. I like the results although I did think they are quite messy. I like idea of using a paint brush to apply it. I will have to check out the FAQ's on the website. Thanks for another great review. I have never used the mists. I get so intimidated by those types of products and have never worked up the nerve to buy any. I would love to give it a try though. It sounds easy enough to use. I have never used Glimmer Mist but am tempted to try it. I have only used glimmer mist a couple of times; I have blue and silver. So far I have liked what I've sprayed, and I would love to try their other projects. I have one or two glimmer mists but I too have just not wanted to use them in case I did it wrong. Dumb I know so I guess I will try experimenting and check out their Q&A on thier web site for more info. I've been dying to try some glimmer mists! Great projects! I have to confess that I didn't like it at first but am now really enjoying using it. I have embraced the splotches and now try for more! it definitely wrinkles your paper when used on a whole page. that irritates me but I have found that if I use very good quality paper and set something heavy on all sides of the paper as it dries then it really helps. the glimmer pieces I love but usually run an ink pad over them to highlight the design instead of glimmer misting them. You guys did great with the Glimmer Mists! I only have a few bottles, but use them whenever I can on projects to give just a hint of glimmer! Photo's usually don't show the great glimmer that you get in real life...I love adding this bit of pizazz! I find that if I start off spraying on a piece of paper and then continue to spray on my project, it comes out nice and even! Thanks for your review and the chance to win these amazing products! I love using GM, especially with Tim Holtz masks! I just use a cardboard lid that came on a paper box to spray all of my projects in...it definitely helps to contain the mess. I've always been able to clean GM up pretty easily with water. Beautiful projects, ladies! I love the grungey feel of mists on paper, although I'm still perfecting my steady (or not so steady hand- it's either all or nothing!) Great examples! Trying to figure out glimmer mist also! These products look amazing. I've heard raves about glimmer mists, but I've never tried them myself. The how-to videos that Kimberly mentions would certainly come in handy! Thanks for the chance to win. I have just one bottle of mist that came with a scrapbook kit. I've used it only once, but it was very effective on that particular project. I've never seen their chipboard. I have a few colors. Even though I love the results the price is what holds me back. Seems a tad bit over priced. I went to office depot and bought a file box to spray in . That way I can use it forever and wipe it down in between colors. Thanks for the chance to win. I have tried glimmer mist but honestly didn't have much luck. Love all the hints & reviews....just might be the motivation to try again! Thanks for the chance to win a great give away!!! I'm a big glimmer mist fan - though I'm always hoping to get some really big splotches! Love that look! I love your projects!! I love seeing new ideas with Glimmer Mist! I am in LOVE with Glimmer Mist, but I don't own any yet! I play with it all the time at the LSS and they are so sweet there, with teaching me how to use and showing me new ideas! One day I am hoping to add them to my stash, but at almost $7 a bottle, thats going to be awhile! I love it but sometimes it is hard to control how it ends up by just spraying. I never used it, but should like to try. I have a few colors of Glimmer Mists and use them occasionally with varying degrees of success. Thanks for the tip on the website - duh! I should have thought to look there for tips. I also have some of their glimmer screens, but have only used them once without much success - I think I need a class!!! I love the projects you made as examples. I am especially interested in trying their chipboard shapes. That banner is divine! Your projects are awesome ladies. Showed me some new ways to use the glimmer mist. Thanks also for letting us know there are tutorials on the site. Will be checking that out. I love the look of Glimmer Mist. I really like Glimmer Mist, I haven't tried the chalk spray and would love to win some. ooooooooh! I SO love all things Tattered Angel! I can't wait to use the chalk mists - still waiting for them!!!! Yes, they are somewhat messy, but the results are worth every bit of mess! I've started collecting my paper towels and whatever else I use under my area when I spray! I LOVE Marshmallow glimmer mist. It adds a beautiful shine to everything! I love that you give honest opinions. I need to try more techniques with the few glimmer mists I have. Practise makes perfect perhaps. As well as the demos on the TA website also watch Heidi Swapps weekly ustreamtv programmes for even more tips. I've only tried these at a crop and haven't been hooked yet. I do love the looks of these projects, so maybe I should add it to my to buy list. I too thought that I had to cover my whole workstation with paper. Then I realized ... a cardboard box works fabulously!! I cut out one side, taped the other three together to make them more sturdy. Prop your item in there and go to town! I never tried that ones. I love to cover chipboard with Glimmer Mist. Great review - I'm very excited about the chalkboard mists! The chalkboard mist looks so cool! Can't wait to try it! lovely, cant wait to try the mists now! Love the fram garland. Gotta try it! Your layout is super cute! I really want some of these mists! I love Glimmer Mist and all other Tattered Angels products. The masks, stamps, glimmer chips and tiles - all of it. I am excited for all the new products to become available. Advice - swirl don't shake or take lid off and stir. Paint on paper with a brush - works wonderfully as watercolor paint. Brush on solid area rubber stamps for a watercolor stamped effect. I Know i pssted a comment in time but i dont see it- wahhhh i love tattered angels -would love some!